Snack time. Who loves snack time? Well, perhaps everyone would raise their hand when it comes to snack. This food we eat between meal and another meal is something that excite us every time. Perhaps it’s made by usual ingredients, made simple and quick, but somehow there’s something different. When we eat snack, we might even can’t get enough of it. It’s too addicting and at times it might gain us weight, if we’re not wise enough about our portion. However, talking about snacks, it’s vary from place to place just like how most popular foods in Yekaterinburg Russia might be slightly different from best and popular cuisine in Siberia. Trying many kinds of it is a good idea to stay away from boredom. That’s why you got to know what are the best snacks made only in Russia. Russian has a lot of yummy and delicious Russian meat-based food that will make you eat with gusto for us to try on. But, what we shouldn’t forget or miss is the tempting snacks that Russia offers for you to take a bite. Whether it’s the homemade one or the manufactured one, both are awesome. These Russian snacks will fill your snack time very well and let you taste their goodness even in tiny portion. These will show you how great a snack can be in such a unique ways that you might not think of. Russian loves sour cream in almost every dishes they enjoy. However, turns out they also use this to serve along with snacks such as Syrniki. It’s a hand-sized fried pancake which is quite popular in Russia. It’s made with farmer’s cheese flour, eggs, sugar, and vanilla extract and served with sour cream, jam, honey, or anything. Made mainly by cheese, yet fried wth oil create Syrniki’s unique texture. Crunchy on the outside, yet still creamy on the inside along with the sweet sides. Although most of the time it’s used as breakfast or dessert, it’s also good for snack to enjoy with friend. For snacks, you can make the size even smaller so you can enjoy it without being too full. Another pancake is on the list But this time, instead of being cheesy with the farmer’s cheese on the batter, it will turn out more fibrous. 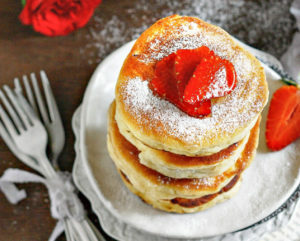 The batter of this small pancake are wheat or buckwheat flour, eggs, milk, salt, sugar, and baking soda. For the milk’s substitute, they usually also use kefir or yoghurt. As for the serving, it’s not so different from Syrniki, though. You might often see this served along with sour cream, jam, honey, raisins, etc. However, this can also be served in the savory version with caviar. What a yummy hand-sized snacks to take a bite of. Who says you can only taste Russia in a homemade food? As technology keep improving, new inventions are made freshly unique all the times. Now, you can taste the typical taste of Russian cuisine in a bag of chips. Dill, the green that you’ll probably get to see in almost every Russian soup, is being used here. As for the salted cucumber, it also represents Russian favorite, which is pickled things. It’s not bad to try eating chips with Russian taste although trying the real and home-made one is also a great idea always. Although this snack can be found outside of Russia as well, but it’s quite popular there. The nuts variations are so wide, from peanut, sesame seeds, sunflower seeds, anything you fancy. These nuts are then dripped with honey to give the right amount of sweetness also to act as a good adhesive for the nuts to bundle up. Beside its crunchiness and stickiness, you can also gain health benefit from eating the nuts in a different way. Another manufactured snacks that allow you to taste Russian’s classic dish in a very different form. This crunchy snack surely has a wide variations of taste that you can choose from. For fish fans and those who like most popular Russian fish dishes that you can try at home a lot, you might try the one with the jellied meat taste. You can also try onion, bacon, or barbecue if you want. This best snacks made only in Russia is also quite popular as a snack that goes along well with beer. Every try snickers in your country? You’ll probably find this bars with caramel, chocolate, wafer, and nut in your country. However, Russia, a country where sunflower seed is quite popular, you can find it in a bar. It’s filled with sunflower seeds and covered in white chocolate. Oh, come on, they are already good as it is by themselves, right? Can you imagine how great would they be to stand together in a bite? What a new way to enjoy this healthy seeds. Who doesn’t love sausage? Well, perhaps everyone would say no to such question. This goodness that you can taste in a sausage is something so addicting, that you might also need to find another way to enjoy it. Rather than just eating sausage being friend along with scrambled egg, why won’t you try it as a snack instead? This sausage rolls is quite famous in Russia. It’s basically sausage rolled in the bread dough then baked till brownish. If you a person who love to bake, you can simply make the size smaller for it to fit as a snack instead of a meal. You can also serve this along with ketchup or use the Russian style, with sour cream. Any ways that you prefer would be great. Fish lovers, another chance for you to gather and take a bite, but this time, from a real fish instead of packed one. Russian love fish as how they love salted foods. They usually salted herrings and process it into many different dishes. However, as a snack to enjoy with drinks or just to fill your stomach right before any meal, you can choose this dish. The salted herrings are cut into pieces that can be eaten at once. Then, all of those cuts are fried until crispy then served along with onions. What a delicious savory snacks that offers both nutritions and taste right to you. Eating snacks is the best thing that you can do when with a friend or family. It lets you enjoy finger-sized food while chit-chatting. This give you bigger opportunity to be closer with your friends through foods. You know, when you come over to your friend’s home and bringing these goodness. Enjoying it alone would be as good as that too. It can be a great friends for your me time. However, if you’re a snack lovers you shouldn’t miss these best snacks made only in Russia. Whenever you get a chance to visit this country, you got to try all the delicious snacks they over. Get a bite and let yourself drown in the goodness.